Your home is your sanctuary—a place where you can relax, spend time with your family, and recharge for your future endeavours. However, you’re not going to breathe easy in your everyday life if you’re not breathing easy in your home. Poor indoor air quality affects millions of homes across the country—and it can lead to a bevy of unexpected expenses, health problems, and frustration. To improve the indoor air quality of your home, it’s important to understand the causes of poor indoor air quality, the effects it has on you home and your health, and the steps you can take to conquer indoor air quality problems not and in the future. As your top-rated Chicago HVAC team, Aircor understands the importance of having clean air in your home. We offer a wide variety of services, including HVAC repair, HVAC maintenance, and HVAC inspection, as well as air duct cleaning services that will ensure your HVAC system is aiding in your pursuit of cleaner air. This guide is designed to help Chicago residents understand how why indoor air quality becomes unsafe, and to point out quick and easy solutions for dealing with air quality issues before they turn into serious, hazardous problem. Let’s take a look. By understanding how indoor air contaminants are formed, you’ll have a much better chance of identifying the cause of poor indoor air quality in your home. Staying self-aware is key—if you notice chronic allergies, breathing problems, or other maladies that only flare up when you’re in your home, poor indoor air quality might be at fault. Once you’ve identified the source of your indoor air quality issues, take action by eliminating the sources of pollutants, improving your ventilation, and hiring the pros to keep your HVAC system clean. According to the US Environmental Protection Agency (EPA), outdoor air is roughly four times cleaner than indoor air. However, this stat should be taken with a healthy dose of context, as pollutants from the outside world are often part of the reason for indoor air quality problems. Let’s take a look at the causes of poor indoor air quality. Pollutants that create poor indoor air conditions come from a mix of indoor and outdoor sources. On the indoor side, tobacco products and indoor smoking, asbestos, loose carpet fibers, household cleaning supplies, pet dander, dead skin flakes, pressed wood furniture, fuel-burning appliances, and new upholstery are just a few things that can contribute to poor indoor air quality. In terms of outdoor pollutants, radon, pesticides, car exhaust, and emissions from nearby manufacturing plants can all make it into the home through open windows and pass through HVAC filters and create poor indoor air quality. Once pollutants enter your home, they’re often recirculated through your HVAC system and trapped amongst your household clutter and HVAC filters, or embedded into carpet, upholstery, and other plush items—all in the form of dust. Without proper ventilation from your HVAC system and a dose of fresh air, this dust can stick around and compound over time, leading to HVAC damage and malfunction, and well as a variety of health problems. 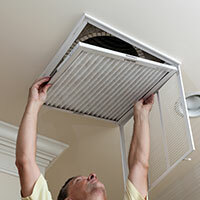 When pollutants and dust make it into your HVAC system, most of their contents are trapped in your air filter. However, not everything is caught by a filter—especially if your filter hasn’t been changed in awhile. Excess pollutants can get caught in your HVAC unit and air ducts, which can lead to the recirculation of pollutants, HVAC unit damage, and a reduction in overall energy efficiency—all of which can lead to expensive unit repairs and spikes in your monthly energy bill. When too many pollutants are trapped in your HVAC system and your home, they can create poor indoor air quality that can compromise your breathing and your overall health. Exposure to pollutants can cause coughing, sneezing, bronchitis, sinus problems, sore throat, nausea, and basically any problem in the book—and these health problems are only exacerbated by the projectile nature of your HVAC system. These are just the short-term effects of exposure to indoor air pollutants. 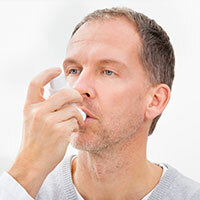 More severe health conditions can develop over time after repeated periods of exposure, including heart disease, respiratory diseases, and cancer. Even if symptoms aren’t noticeable, it’s important to be proactive in identifying and removing indoor air quality hazards so you can avoid health problems now and in the future. Identifying poor indoor air quality is truly a test of the human senses; what you see, smell, and feel can tell you a lot about the overall quality of air in your home. Let’s take a look at common identifiers of poor indoor air quality. Moisture accumulation on surfaces inside your home is a sign of high humidity, which is a catalyst for mold development and its accompanying health problems (more on this later). High humidity in your home also accelerates the development of bacteria, and can trigger sleeping problems. Another sign of moisture accumulation and poor indoor air quality is the feeling of smelly or stuffy air—an issue that alludes to the presence of other indoor pollutants. If air smells or tastes strange or stale, you’re at risk for a variety of allergies, sleep difficulties, and overall health problems. If your filters and vent covers are caked with dust, or you notice dust and debris buildup in your air ducts, you’ve just discovered a sign of poor indoor air quality. 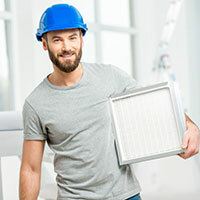 HVAC systems are naturally designed to filter, clean, and dehumidify the air—so if your filters are trapping plenty of debris and becoming saturated with dirt at a quicker rate than you’re used to, it’s probably time to evaluate the state of your indoor air instead of just changing your filters. There’s no way to completely protect yourself from pollutants and achieve pristine indoor air quality. However, there are plenty of actions you can take to dramatically reduce the number of pollutants in your home so you can breathe easier and live better. Source control is the most important step to take in order to improve your indoor air quality. While many people will take allergy medications or opt for a “deal with it” mentality when it comes to poor indoor air quality and its accompanying symptoms, it’s much more beneficial to deal with the source rather than the symptoms it causes. Take a look around your home—is there mold that needs to be removed? Is there a pet cat that could use a shave and a bath? Could your gas stove be adjusted to reduce emissions? These are all questions you should ask before taking action to improve the air in your home. It’s also important to pay attention to the outside sources of air contamination. If you live next to a busy street with plenty of automobile traffic, try closing your windows during peak traffic times to reduce the amount of exhaust that could be entering your home. Ultimately, it’s up to you to take action. Take a lap around your house to identify pollutant sources, and take the action necessary to minimize or eliminate their effects. While source control is the most effective solution for improving indoor air quality, it certainly doesn’t hurt to give your home a breath of fresh air—or more specifically, increasing the amount of fresh outdoor air that enters into your home. As we stated earlier, outdoor air is generally four times cleaner than indoor air—even with the presence of common outdoor pollutants—so regardless of what’s happening around your home, moving outdoor air in is a solid plan. Most HVAC units do not bring fresh outdoor air into the home. Instead, they recirculate indoor air that might already be polluted. To solve this problem, you must bring fresh air into the home mechanically by opening windows, using window and attics fans, or using a window air conditioner with your vent control set to open. It’s also useful to take advantage of kitchen and bathroom fans that move polluted air directly out of their respective rooms, as this will remove polluted air out while fresh air is coming in. Some newer homes will also feature mechanical systems that bring outdoor air in, and they usually utilize air-to-air heat exchangers. Talk to your local HVAC company to learn more about these systems and how they can help your home. In some cases, air cleaners might be a solid option for improving the air quality inside of your home. While these machines do not remove gaseous pollutants, they can eliminate harmful dust, spores, bacteria, and other particles that are often the cause of allergies and breathing problems. By nature, air cleaners are not energy efficient—but they still might be worth your time if your indoor air quality is affecting your health. While choosing an energy efficient model might save you money, it won’t clean your air as effectively. Choose a model with a high air-circulation rate (usually expressed in cubic feet per minute) for the best results. In order to achieve a high quality of indoor air, it’s important to do everything in your power to eliminate pollutants at the source and keep your ventilation system as healthy as possible. By keeping your home clean, addressing sources of air contamination, and having your HVAC system services regularly, you’ll be well on your way to cleaner air, better health, and a better life. That’s where Aircor can help. Our Chicago HVAC team offers air duct cleaning, air conditioning maintenance, air conditioning repair, and basically any other heating and cooling service in the book so your home can have the best air possible. We’re also happy to discuss what might be affecting indoor air quality in your home, and find solutions to help you make your home’s air more comfortable. The time for better air quality is now—call Aircor with any questions, and schedule an appointment today!